Sonic Heroes is a video game in the Sonic the Hedgehog series. It is the first multi-platform game in the Sonic series. The game was developed on the Nintendo GameCube, then ported onto the PlayStation 2, Xbox, and Windows. 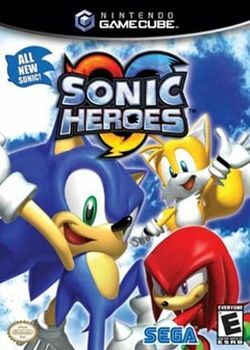 The phrase "Sonic Heroes" refers to the uniting of the protagonists of the Sonic the Hedgehog series. The game introduces several new gameplay elements. Unlike past Sonic games, which have all had a player controlling one character, players are able to control three characters at a time, switching the party's leader from speed, power and flight. This game also marked the return of many characters from the Sonic universe: Chaotix, a group last seen in Knuckles' Chaotix on the Sega 32X; Shadow the Hedgehog and Rouge the Bat from Sonic Adventure 2; Cream the Rabbit from Sonic Advance 2; Big the Cat from Sonic Adventure; Metal Sonic, who, prior to this game, had not played a major role in the series for years, the last having been in Knuckles' Chaotix in 1995. The game also introduces a new character, E-123 Omega. Although the plot for Sonic Heroes is somewhat sparse, a portion of it, particularly Team Dark's storyline, was a set-up for Shadow the Hedgehog released in 2005. This page was last edited on 26 July 2018, at 14:27. This page has been accessed 19,716 times.